Verderame is the italian name for verdigris a refined green pigment used in painting to obtain sought-after effects of transparency and at the same time is the substance that in nature is used for the protection of plants, ensuring their life. 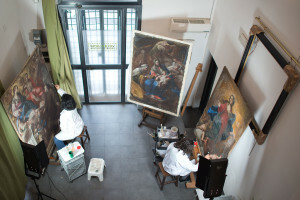 Verderame is a no profit cultural association founded in 2012 by Giulia Silvia Ghia, the current chairperson, with a group of experts in various fields of cultural heritage: art history, conservation, restoration, management and exploitation , marketing, diagnostic surveys, legislation. The group frees part of their time for the conservation, knowledge and enjoyment of our national artistic heritage. Verderame is a facilitator, which creates synergies with many different realities, for the realization of projects of valorization, restoration and technical study, the organization of events, also in the field of social inclusion, historical-artistic studies, publications and everything that allows the promotion of culture as a common good. For this reason, VERDERAME organizes training and publishing activities, it conducts experimentation activities , research and technological innovation, promoting projects with universities in Italy and abroad. Its activity is carried out exclusively by means of funds raised by supporters, institutions, foundations, banks and private citizens.